When I was a teenager, I worked at a hole-in-the-wall Chinese take-out joint. This wasn’t anything like the Chinese fast-food places you see in the malls. The food was cooked to order and the chef/owner was actually Chinese. My job was to work the counter taking orders, serving food, etc. When it was slow, I was put to making wontons, rolling egg rolls and helping with general prep. This is when I learned about oil blanching...the Chinese culinary secret that results in the most tender stir-fried meat. It’s also done on vegetables, particularly green beans. It will turn the woodiest, thick-skinned green beans into something spectacular. Unlike oil blanching beef or chicken (aka velveting), vegetables aren't coated with a cornstarch slurry. They are just plunged into hot oil without much ado. I don't recommend this method for those thin, dainty green beans you bought at the farmers' market; it works best with the woody, thick-skinned kind. If you do this right, the dish doesn't feel heavy or oily, but if you’re one of those who are scared of fat, just skip the oil-blanching bit. It’s still a tasty stir-fry, but you won’t get the same texture (which, in my opinion, changes the experience a bit). Mix the oyster sauce, soy sauce, sugar and water together in a small bowl. Stir to dissolve the sugar. Set aside until needed. In a wok, heat the oil over medium heat to about 325° to 350°F. Add the green beans (make sure they are dry!) and gently cook until the skins start to blister. Remove and drain on a rack and/or paper towels. I do both. Remove all the oil from the wok. An absorbent paper towel will remove the last tablespoon or so. Increase the heat to high. 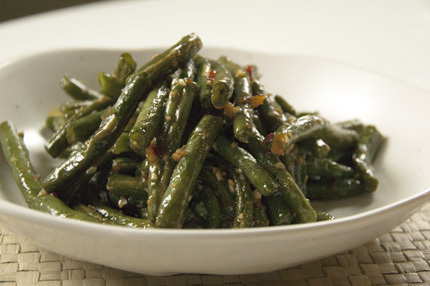 When the wok gets really hot, throw the green beans back in with the garlic and chili-garlic sauce. Stir-fry for about a minute, then add the soy sauce mixture, drizzling down the sides of the wok. This will promote caramelization and concentrate the flavors. This is a dry type of stir-fry, so once the beans are coated with the sauce and the excess liquid has evaporated, you’re done! Enjoy with a bowl of steamed rice! *I use the Huy Fong Foods (Rooster) brand chili-garlic sauce. It’s much spicier than the Lee Kum Kee brand. Both work fine.